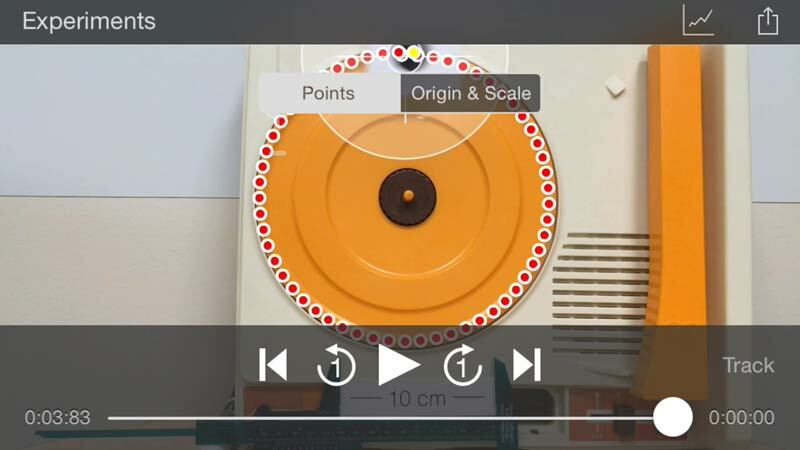 Video Physics for iOS brings physics video analysis to the iPhone, iPod touch, and iPad. Just played with new Vernier video physics app on iPhone – it ROCKS! I remember the day when this would’ve cost thousands of dollars to do. You should check out Vernier’s Video Physics app. Students can email video analysis data to Logger Pro; very cool!! Vernier’s Video Physics app is slick. It’s a handy app, and if you teach High School Physics, then it’s highly recommended. App Store featured: Staff Favorite, New and Noteworthy, and What’s Hot! Objects that are very different than their background (black/white) work best for automated tracking. It is also helpful to use a background with uniform color and shading. See our sample videos for examples. Do not move the camera. Analysis assumes the camera is fixed in position. The object in motion should remain approximately in a plane perpendicular to the viewing direction. Place an object with known dimensions, such as a meter stick, in the same plane as the motion. Use this to scale the video. Video Physics is intended for use in science education. The video analysis done in Video Physics provides a useful technique for studying two-dimensional kinematics. You can do even more with Vernier’s Graphical Analysis app for iPad, iPhone, iPod touch, and Android or Logger Pro software for Mac OS X and Windows.